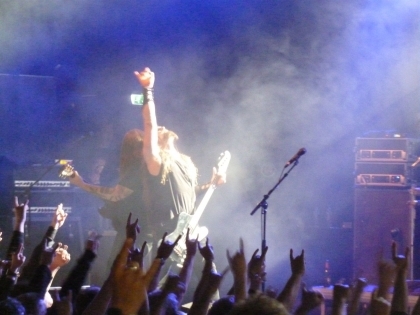 As part of Dimmu Borgir's Abrahadabra tour, the show held on October 18th in Oslo, Sentrum Scene, was opened by two support acts: Shag and Enslaved. Due classical Norwegian habits of forspill (pre party, foreplay) I missed Shag and got to the venue 2 minutes after Enslaved just started. The scene they played on is part of the Rockefeller/John Dee complex and has a capacity of about 1700 people. As I heard the concert was sold out, hence it got more and more crowded with each song. There is an 'upper' floor or balcony where you can sit down and you are not allowed to stand or sit on the stairs (which in the end, is quite a smart thing as you'd probably hate to sit and get your view blocked by a 2x2 standing bloke) and the floor downstairs has enough small stairs to allow dwarves like me to actually see something on stage. After few minutes of trying to locate a decent spot, we actually started watching the progressive black metal performance that was developing on stage. Nothing fancy from the point of view of stage setting, except a skull attached to the drum kit. The band had recently released an album, Axioma Ethica Odini, which I, personally, haven't heard yet, but from other comments it sounds like it is a masterpiece. They have 20 years of experience behind them and that can be easily seen on stage. They play their stuff tight and professional. And it's amazing how their music tends to almost fall on the side of 'dullness' at times and after few 'slow' moments it kicks in with either an incredible riff from guitarist Ice Dale or a rough wake up growl of Grutle Kjellson. I am especially fond of the backing vocals from keyboardist Herbrand Larsen, who made a perfect contrast with the evil growls, yet it added this touch of calm in the overall loud and demonic music. Oh, as for the drums, mmm. They played for about one hour and mostly tried to bring up their latest stuff, but that doesn't mean they ignored hits from past albums and received great cheers from the crowd when playing songs from Ruun or Isa. Overall this was the 'serious' part of the night. Not that Dimmu would be unserious about music, but it's not the main thing to concentrate on at their theatrical show. They come up on stage during the demonic sound of Xibir after the stage got totally covered in smoke. The drumkit was piled up with cymbals and decorated with a bunch of skulls, both 'simple' and horned, like on the album promo photos. Everyone wore corpse pain, the keyboardist had some sort of spiked mask around his head, they wore capes with fur and fox heads attached until it got too warm for them. Spiked microphone stand, arms wrapped in spiked sleeves, Shagrath's legs surrounded by some up-to-knee wrappings having skulls on top of them, metal gloves - I think, chains around the chest, and many other details that one kept noticing when not head banging or later on in the photos I took. They pretty much tried to replicate the outfits I saw in the videos of 'Gateways' so watch that one to get a more accurate impression. Since the name of the tour is 'Abrahadabra', like the band's 2010 release, they played a lot from the album. The song 'Dimmu Borgir' was my favorite from the chosen ones and it's somehow too bad they had to use recordings for the nice choirs. But the surprise was that they actually had the female singer for 'Gateways' and she did a very good job for her part. The crowded reacted well to most of the playlist, but the biggest cheers were for the songs towards the end of the show and the comeback: Serpentine Offering, Puritania, Progrenies of the Great Apocalypse or Mourning Palace. Performance wise, nothing exceptional to notice - maybe the low sound in some instruments at the beginning - since everything was well wrapped in theater moves and with many recorded parts. 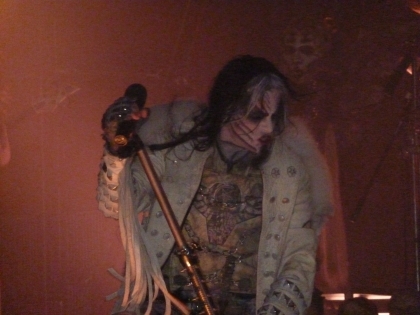 But Shagrath keeps his known growl for the duration of the concert and the drums are like a 10 marching armies at once. Another thing to catch your eye was the impressive light show. Quite well coordinated with the music and you can tell the band's wealth from it. Whoever is responsible for it, is quite good at that.